Shares of Zynga (ZNGA) surged 5% early Thursday after the company said it had filed an application for a gaming license in Nevada. The news, announced late Wednesday by Zynga chief revenue officer Barry Cottle, is a step towards real-money gaming, or RMG, for the company. Zynga has been struggling to make money off what appears to be the waning popularity of its social-network based games. "This filing continues our strategic effort to enter regulated RMG markets in a prudent way," said Cottle, adding that the application process should take about 12 to 18 months. Zynga, best known for FarmVille and its other -Ville franchises, has already taken steps to expand into the quasi-legal world of online gambling. It recently partnered with bwin.party, the British gaming company that specializes in online sports betting, poker and bingo. 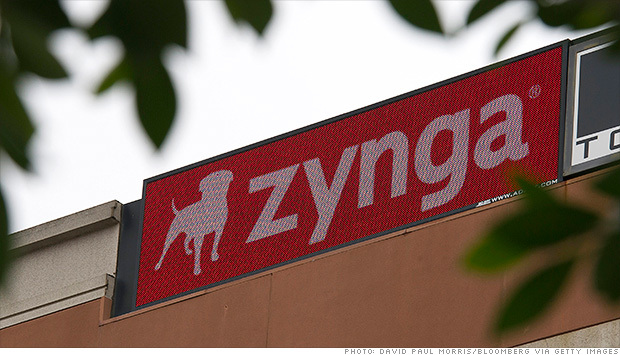 Cottle suggested that Zynga could one day offer similar products in the United States. "The broader U.S. market is an opportunity that's further out on the horizon based on legislative developments, but we are preparing for a regulated market," he said. Related: Not yet game over for Zynga stock? The gaming industry has lobbied Congress to relax laws against online gambling, arguing that games such as poker are based on skill rather than chance. But federal authorities have cracked down on offshore companies that have made millions on internet poker. The move into real-money gambling is a potential game changer (wah-wah) for Zynga, which recently laid off 5% of its employees and has significantly lowered its outlook for earnings this year. Zynga is facing mounting pressure as it struggles to keep users buying virtual goods on its biggest platform: Facebook (FB). The social network makes money from games like Zynga's Farmville and Mafia Wars, but users have cut back on their purchases. Facebook's latest earnings report showed a 20% decline in payments revenue from Zynga over the last year. Last week, Facebook and Zynga revised the terms of five-year deal they signed in late 2010. Under the new agreement, Zynga won't have to use Facebook as the exclusive way to log into games on the newly launched Zynga.com, which Zynga hopes to build into a standalone gaming destination. In addition, Zynga won't be required to use Facebook's ads or virtual payment system on Zynga.com and is no longer required to use Facebook "as its primary non-Zynga platform."